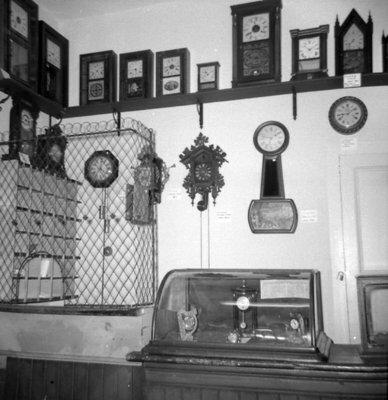 A black and white photograph of clocks on display at the Whitby Historical Society Museum. View is of the south wall. The Whitby Historical Society was founded in 1967 and is a Not for Profit Organization that is made up of volunteers. It owns a collection of artifacts representing Whitby's history. This was part of the clock display at the Whitby Historical Society Museum in June of 1968. Clock Display, Whitby Historical Society Museum, June 1968, Brian Winter. Whitby Archives A2013_004_298.